Lake City Lodge No. 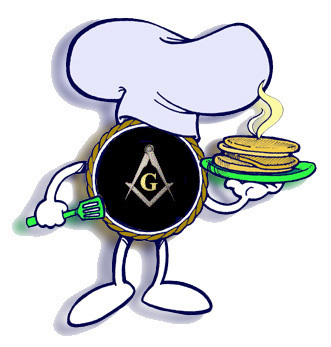 127, Oswego’s Masons will hold its monthly All you Can Eat Pancake Breakfast/Breakfast Buffet Sunday March 15 from 8 a.m. – noon at Oswego Masonic Hall (Lake City Lodge) 765 E. Seneca St.
Public event, all invited, bring friends, relatives, spouses, kids, everyone is welcome! Menu: pancakes, French toast, eggs, bacon, sausage, home fries, coffee, tea, milk, orange juice, and all the fixin’s, even real butter! Price is: adults: $7, kids: 6-11 $5, kids: 5 and under free. Funds raised go to support our efforts toward community groups or Masonic Charities and to support the Lodge. The breakfast is jointly sponsored by Lake City Lodge No. 127 F & AM & Lake City Victoria Chapter No. 205, Order of the Eastern Star. Lake City Lodge No. 127, Oswego’s Masons monthly pancake breakfasts have been used to support lots of local groups like: the Lady Bucs Softball Team, Friends of Oswego County Hospice, The H. Lee White Museum, Oswego County Habitat for Humanity, The Oswego Community Youth Orchestra, Cub Scout Pack 888, and many others. We also offer “Free Will” breakfasts from time to time where donations are accepted, but not expected. Freemasons are one of the most charitable organizations on the face of the earth, in the US alone they raise over 2 Million Dollars a Day for Masonic Charities and that’s not including the funds raised for community groups. Many Masonic Charities are in the medical field, like the Shrine Hospitals for children with crippling diseases and burns, the Masonic Medical Research Laboratory which works on cures for heart disease, the Knights Templar Eye Foundation working on diseases of the eye. There are many others.